It is easy for people watching to become one of your main habits while in Tel Aviv, due to the combination of its outdoor culture, laid back vibe, ridiculously good looking people, and abundance of pleasant spots to sit and take it all in. With its trendy cafes, charming green avenues lined with benches, and its sprawling beach promenade, Tel Aviv does not lack options for people watching! Situated in central Tel Aviv at the bottom end of Rothschild Avenue, Kikar Habima is a beautiful square that’s home to Habima Theatre, the world’s first Hebrew language theatre. With its pristine flower garden and charming wooden seating area built into the ground in the middle, its picturesque wooden stairs that lead up to a tree circled by seats, in addition to a couple of cafes with chairs spilling out on the square, Kikar Habima is one of the best people watching spots in Tel Aviv. One of the trendiest spots in Tel Aviv, Rothschild 12 is a bar, cafe, and restaurant with a charming outside seating area reminiscent of the cafes and restaurants of Paris. Facing out onto the busy yet beautiful Rothschild Avenue, this is undoubtedly one of the best spots to sit down in with a coffee, cocktail, or meal and watch the afternoon or evening unfurl in front of you. Make the most of it while you can, as it is soon to be replaced by a glitzy new hotel. Not only does this restaurant serve up delicious Italian food, but it is also situated in one of the most pleasant spots in all of Tel Aviv. Allora’s outdoor balcony looks down over the charming Ben Gurion Avenue, where you can watch people casually strolling to and from Gordon Beach, which is down the road. They also have a restaurant on Rothschild. This charming neighbourhood favourite cafe-restaurant sits on a street corner overlooking the greenery of Milano Square, in northern Tel Aviv. Its homey, chilled-out atmosphere and delicious coffee and food makes this an ideal people watching spot in one of Tel Aviv’s most pleasant areas. Running the length of Tel Aviv’s gorgeous coastline, from Jaffa to Tel Aviv Port, the tayelet is lined with benches and restaurants, where you can relax to the sound of the sea while watching beach-goers and joggers come and go. People play games of matkot (beach paddleball) and dogs let off steam in the sand. Come for sunset for particularly dreamy views over the Mediterranean Sea. Tel Aviv is lined with small, charming outdoor coffee kiosks that encapsulate the laid back vibe of the city and its coffee culture. Day or night, they are busy with people sitting and conversing while sipping on an afuch (Israel’s version of a cappuccino). Stroll down Rothschild or Ben Gurion Avenues and take your pick! This square in the centre of Tel Aviv is named after Yitzhak Rabin, the former Israeli Prime Minister who was assassinated during a peace rally in 1995. Now, it is equipped with hammocks, benches and chairs that offer a pleasant time-out in the heart of the city. 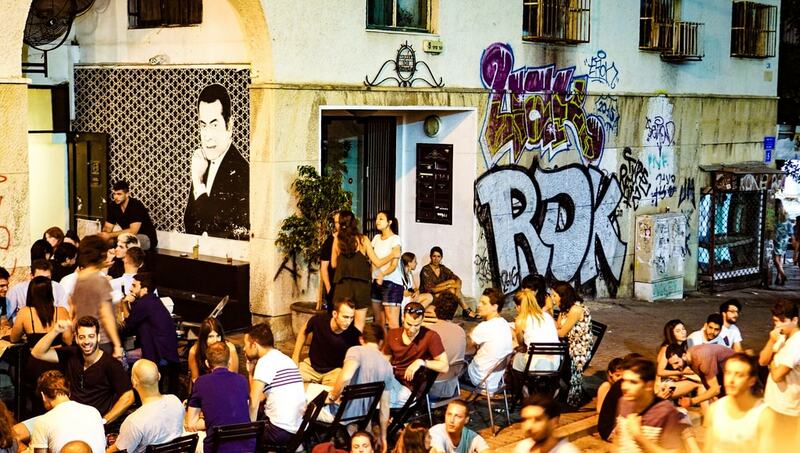 Another of Tel Aviv’s trendiest establishments, Port Said is the place to be if you want to eat great food (by the famed chef Eyal Shani), have a few beers and be surrounded by the city’s cool kids. Situated next to the Great Synagogue off Allenby Street, Port Said’s outside seating area is a great spot to soak up the city’s nightlife and gaze at the passersby. This huge park in north Tel Aviv, with a tranquil river running through it, is the perfect place to take a picnic and watch the world go by. Find a spot on the grass and watch the joggers, families, and young couples pass you by.